This white paper illustrates a new patent-pending approach that may be helpful in certain new product forecasting situations. It combines human judgment with time series mining and statistical modeling. 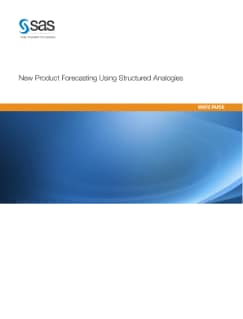 This "structured analogy" approach helps automate the selection of analogous products ("like items"), facilitates review and clustering of past new product introductions, and generate statistical forecasts. Users can make manual overrides to the statistical forecasts, and get a better sense of the risks and uncertainties in new product forecasts through visualization of past new product introductions.